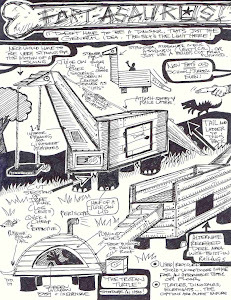 Fort A Day: A "temple" Tree House/Fort in Washington State. 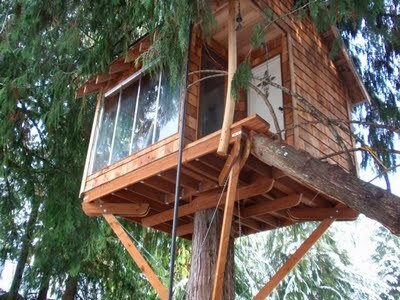 A "temple" Tree House/Fort in Washington State. I can't find any more photos on this one, but its just friggin' fabulous. I especially love the large bay of windows in the front- which, I'd assume, either face south, or some great view (at least I'd hope so). This tree house has a lot of character, and is referred to as a "temple tree house", perhaps for religious reflection, and for the builder/owners writing/work. Its a simple design overall, but one that is so effective and pleasing to the eye- I just wish we had more trees like that here on the East Coast. 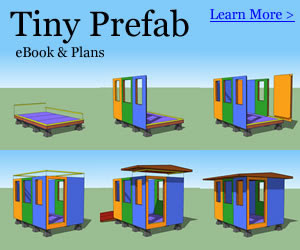 This little structure, while not legally, would make for a great tiny house, or getaway cabin up in the trees, OR the world's coolest kids fort or playhouse! I hope I can find more on this one! Especially photos! 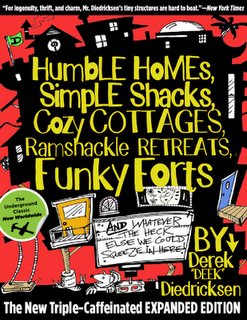 For more on tree houses and tiny houses- check out my book "Humble Homes, Simple Shacks"